The news of failed stress tests keeps coming back. Several banks, amongst them, Deutsche Bank failed the stress test required by the FED for the second time end of June. The reason wasn’t insufficient equity but insufficient risk management. Nowadays regulators assign a high degree of importance to adequate implementation of risk management strategies, with a special emphasis on model governance: models for valuation, risk measurement and management need to be kept current and their performance regularly monitored. All issued arising from models are summarized under the term Model Governance, and are considered as a potential source of risk per se. What exactly is model risk? It is a well-known fact that risk models do not capture reality, simply because they are models. The question is how to quantify the remaining risk of a model. The choice of a model and its calibration must be constantly monitored and challenged. The experience of past financial crises and their impact on the models should become a part of the risk model landscape. For many years, models in front-office generated different results than models in controlling and accounting departments. It has been a long-term future vision of many banks to cure this wide-spread discrepancy. The EBA (European Banking Authority) requires a 90% confidence interval in the choice of valuation models when calculating the model-dependent position in the balance sheet in its ”Regulatory Technical Standards on Prudent Valuations“ of 2015. This must be guaranteed on top of the value adjustments based on already known model weaknesses. In other words, a change of models or parameterization of a model must not lead to a more than 10% drop in value. These new requirements on technical standards generate new challenges. How can we quantify how toxic a model is? To judge this we need to understand financial products in full detail so we can tell which market scenario would change the value or risk parameters of the financial product to which extent and whether this effect is captured by the model in place. After such an analysis we can propose an alternative model to then guarantee the valuation to be in a 90% confidence interval. The model development must be clearly documented and documentation has to follow certain standards. External software must satisfy the same standards as in-house productions (no more black boxes). As a rule of thumb, an independent entity must be able to reproduce values and risk figures based on the model documentation. The form of the documentation must satisfy the rules of the regulatory authority. This is assuming the independent entity has reasonable competent resources. The model validation must also follow pre-defined standards. In particular, possible limitations of a model must be clearly identified and documented. The consequences of limitations must be clearly stated, e.g. to replace a model with a better alternative within a given time-frame, or to restrict trading financial products where model risk is too high to be acceptable. The model performance must be regularly monitored, even after it has been validated. For example, one can monitor the stability of the calibrated model parameters over time and conduct market conformity checks. The daily P&L of the trading activity must be explicable based on the risk sensitivities of the model in place. (P&L Explain). This requires establishing risk standards and applying these to all models in production and monitoring the quality of sensitivity parameters compared to the P&L. P&L Explain is highly non-trivial and has gained high degree of attention. A functioning P&L Explain is necessary condition for the approval of a firm-wide Value-at-Risk calculation of a bank. All these processes must be coordinated in regular (monthly) meetings, where development, validation and performance monitoring must be documented. An example of model performance monitoring is checking the robustness and smoothness of the local volatility surface for derivatives, which is calibrated to tradable market prices of vanilla options quoted by implied volatilities. Robustness is required to prevent model-caused P&L swings. 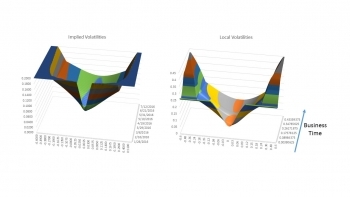 The 3-d graph of local volatilities is like an x-ray of the model. By pure visual inspection one would easily detect model weaknesses. The example of a USD-JPY surface does not have any spikes; it is smooth in the relevant area, which indicates that the calibration of local volatilities works well. A so-called model owner is held responsible for the complete process of development, validation, documentation and performance monitoring. The model owner guarantees that the causer of risk in front-office will be held responsible for the management of the resulting risk and guarantees sufficient financial and human resources for this purpose. Model validation as part of risk control is completely independent and gauges the suitability of models. Front-office is made responsible for implementing the quality standards set by model validation. Along with front-office and model validation, internal revision is a third column to defend model risk. It validates the performance of the models, their operational efficiency and standard documentation of development and validation on an ongoing basis and protocols regular model governance review meetings. The changing regulatory requirements lead to the following consequences: an increased initial effort is to be expected. External advice can help speed up the process in identifying a roadmap and designing a governance process. Initial effort will be rewarded by long-term model governance stability. An improved bank-wide awareness of models and their performance will eventually align the interests of front-office and risk control. Senior management will be able to take an informed decision on which products to trade and can optimize the portfolio structure. Boris Borowski, Senior Financial Engineer at MathFinance, will present the Model Risk Control of Derivatives on the Market Risk-Forum 2016 on 15 September 2016 in Cologne. “Model Governance – Wie sich das Risiko der Modelle in den Griff bekommen lässt“ will appear in Risiko Manager, September 2016, pp 18-20. EINLADUNG ZUM »SCIENCE IN FINANCE«-WORKSHOP! Lernen Sie d-fine kennen – nicht als Bewerber, sondern als Berater! Erfahren Sie, wie Sie Ihren mathematischen Hintergrund und Ihre analytischen Fähigkeiten einbringen können, um die Stabilität der Finanzmärkte zu erhöhen. Als Berater in einem Projektteam von d-fine werden Sie für die d-fine Bank AG ein Modell entwickeln, um das Institut rechtzeitig in die Lage zu versetzen, die neuerlichen Bewertungsanforderungen der Aufsicht zu erfüllen – hierbei handelt es sich um eine Arbeit direkt aus der täglichen Praxis von dfine. Erfahren Sie durch die Teamarbeit mit Ihren Kollegen/innen und in der Interaktion mit den Abteilungen der Bank, wie herausfordernd und viel fältig die Arbeit eines d-fine Beraters ist! dfine ist mit über 600 Beratern und Büros in Frankfurt, München, London, Zürich und Wien eines der größten auf Projekte rund um die Themen Risikomanagement und Finanzsteuerung spezialisierten Beratungsunternehmen in Europa. 3tägiger Workshop mit Vorträgen zur Finanzmathematik, einem Kundenprojekt unter Ihrer Beteiligung und Erfahrungsberichten aus unserer ConsultingPraxis. Bewerbungsschluss ist der 12. September 2016.